I'm trying to control a motorized fader (linear slide potentiometer) using an Arduino. PID control gives good results for "jumping" to a specific target position, but tracking ramps is a problem, it's not smooth at all. The movement is very jerky, no matter what I try. And here's a video of that same test. On commercial systems, it seems much smoother, see this. The motor fader is an Alps RSA0N11M9A0K. To drive it, I'm using an ST L293D H-bridge, powered by a regulated 10 V DC power supply (XL6009). On the Arduino UNO (ATmega328P), I'm using pins 9 and 10, with a PWM frequency of 31.372 kHz to make it inaudible (Timer1 with a prescaler of 1, TCCR1B = (TCCR1B & 0b11111000) | 0b001). The potentiometer is wired between ground and 5V, with the wiper going to ADC0, as usual. I've tried adding an EMA filter to the input, to the control signal, to the derivative component of the PID controller, but no avail. I also tried lowering the resolution of the analog input, using hysteresis to stop it from flipping between two values when stationary. This doesn't seem to affect anything. Increasing the time step to 10 ms doesn't seem to help either. I've also tried doing a system identification in MATLAB, and tried tuning it in Simulink (following this video series). I got a model with a fit of 91%, but I didn't know how to deal with the input and output non-linearities of the MATLAB model, how they affect the PID tuning, and how to implement it on the Arduino. The final thing I've tried is making two different controllers: one for large jumps in the reference position, and one for small errors when tracking a ramp. This seems to help a bit, because then I can increase the integral coefficient when tracking, without increasing the overshoot when jumping. I have virtually no derivative gain, because increasing it higher than 1e-4 seems to make it even jerkier, and I don't really notice any difference between 0 and 1e-4. My guess is that it needs more power to overcome static friction, then the dynamic friction is less, so it overshoots, so it drives the motor backwards, causing it to stop again, then it has to overcome static friction again, it shoots forward again, etc. How do commercial controllers overcome this problem? I'm in my third bachelor year of Electrical Engineering, I've followed courses on control theory, digital signal processing, LQR control etc. so I have some theoretical background, but I'm having trouble applying all those theories to this real-world system. 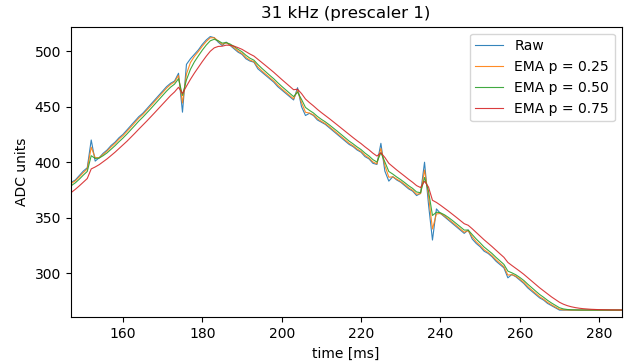 I've tested the open-loop sensor measurements, as laptop2d recommended, and I'm quite surprised with the results: At high PWM frequencies, there are nasty peaks in the readings. At 490 Hz, there are none. And this is at a constant duty cycle, so I can't imagine what kind of noise I get when the motor is reversing direction very quickly. So I'll have to find a way to filter that noise out before I start working on the controller again. Using an exponential moving average filter was not enough to filter out the noise. I've tried with poles in 0.25, 0.50 and 0.75. Small poles didn't have much effect, and larger poles added too much latency, so I had to lower the gains to keep it stable, resulting in worse overall performance. I've added a 0.1 µF capacitor across the potentiometer (between wiper and ground), and that seems to clean it up. For now, it works well enough. In the meantime, I'm reading through the paper posted by Tim Wescott. A control system is only as good as it's sensor, run the sensor open loop and remove the control input. 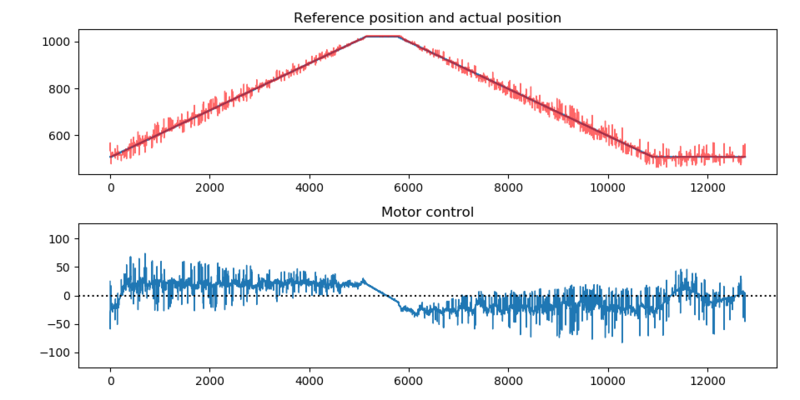 Create your own input to the sensor and slide it slowly (or find a way to slide it slowly reliably) while taking position data to make sure it's not the sensor. If the sensor is noisy, then improve the performance of the sensor by getting a new sensor or paralleling it, or by filtering the output of the sensor. You may need a sensor with higher resolution. If the sensor is not noisy then you'll need to get a different control loop. PID's are first order systems and not really great at rate control. You are correct that the problem is from friction, or possibly a combination of friction and backlash. 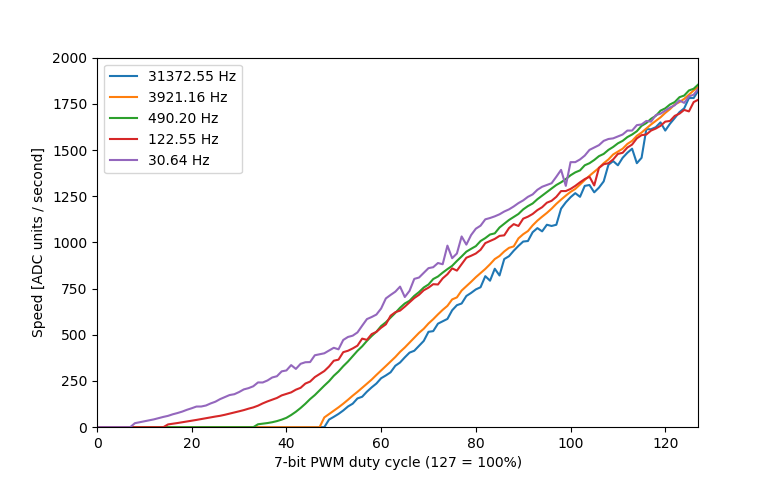 Your plot of average speed vs. duty cycle for various pulse widths is characteristic of a system with friction. This paper explains what you're seeing, and has a compendium of solutions that have been used since forever to deal with the problems. You will not have seen them in your engineering curriculum because they're hard to analyze; you basically have to fiddle with them on a case-by-case basis to get them to work. I don't know what commercial controllers do, although I suspect that there are a variety of solutions out there. What I've done in the past with things like this is when the motor drive signal out of my PID controller falls below some threshold (probably 60 to 70 counts in your case) I start pulsing the motor drive at the threshold, with a duty cycle that makes the average drive equal to the PID output. I generally use a sigma-delta-ish modulator for this because it can be implemented in very few lines, but you can go with whatever works for you. Where \$0<<\alpha \leq 1\$. The closer to 1, the smoother is going to look, but it also adds more lag, start with a value of 0.9, for example and see how it behaves. It seems most of the noise is coming from the PWM drive signal. Have you tried synchronizing the ADC capture to the PWM cycle? Most microcontrollers have a way to trigger the ADC capture on timer, so you can always trigger at the same point of the cycle. 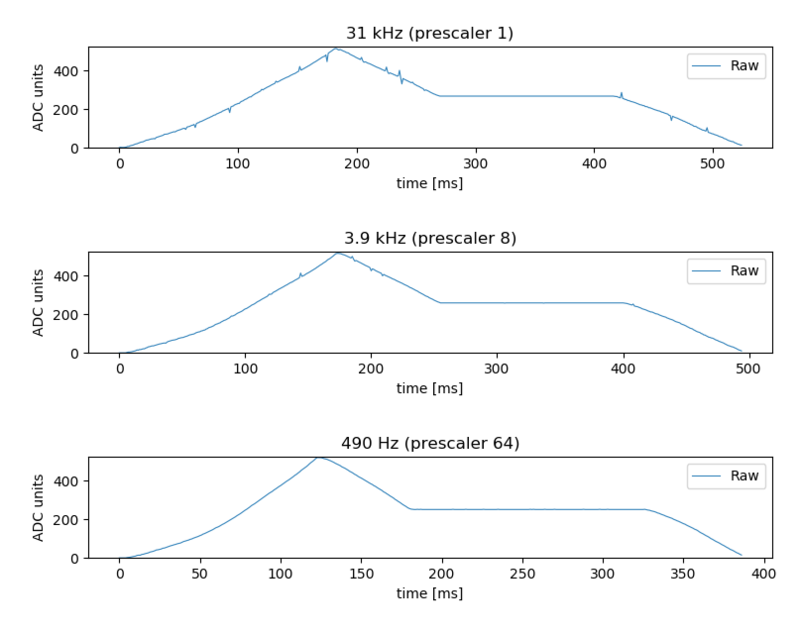 For lowest noise, optimal sampling position would be right before switching the power to the motor on, because then any spikes have had the longest time to settle. But no matter what the position, synchronizing the capture will reduce spikes because the amount of offset will remain approximately same at the same point of the PWM cycle. Not the answer you're looking for? Browse other questions tagged arduino control-system motor-controller pid-controller or ask your own question. Why have a PID controller for a DC servo motor?